Are you wondering why you keep seeing the number 7? Or perhaps your last grocery bill came to 77.77 or the number you just dialled into your phone ended in 777? Do these numbers have a message, and is that why they keep appearing in your life? WHAT IS THE MEANING OF 7? In numerology, the number 7 is a deeply mystical number. It represents the meeting point between Earth and Spirit, the place where embodied learning occurs. People with a lot of this vibration in their charts are destined to channel a lot of wisdom, and ground their spiritual experiences powerfully into the earthly plane. It’s not an easy task, it can require painful lessons to be learnt and personal sacrifices to be made, but it’s so necessary for our species right now, and for the rapid expansion that we’re all moving through. So if you’re seeing the number 7 repeating around you, you’re being encouraged to deepen into further understanding within your own life. You have powerful learning to do, and the lessons you are facing will benefit the collective – we are all one on this journey! The number 7 can also be a sign that you need to seek solitude. Perhaps you are socializing to much, as an escape from the real inner work that is being asked of you? Seeing angel number 7 is a powerful sign that you must trust your intuition and allow the wisdom you hold inside to lead the way. WHAT IS THE MEANING OF 77? If you keep seeing 77 you’re being given the clear message to look below the surface of life and dig a little deeper. It’s time for you to gather more information and make more sense of yourself and the world than you have tried to do before. Some conscious growth is required of you now, and this requires humility, and for you to keep your ego in check. WHY do you keep reacting in the same, tired way to situations around you? WHY do the same patterns keep showing up in your life? WHY are you at a sticking point in your relationship/career/personal growth? Follow the threads of honesty and truth you find inside, to figure out some answers. The temptation may be to seek those answers externally – the number 77 reduces to 5 (7 + 7 = 14, and 1 + 4 = 5) and the 5 vibrates with the energy of research, investigation and exploration,) but be careful not to misinterpret the message of this number. The number 77 requires you to trust your own perspective above all else. Seeing angel number 77 is a wake-up call! Look inward and ask yourself what you really want, and whether your inner and outer worlds are aligned. If you’re seeing 777 it’s time to sit up and take note! The Universe is telling you that you are on track, and aligning with your highest possible version. Stay informed. Keep your eyes open and your aim clear. 777 is a strong sign that you must trust your own inner wisdom, so when you see this angel number, it is incredibly reassuring. The Universe wants you to know you got this!! 777 reduces to 3 (7 + 7 + 7 = 21, and 2 + 1 = 3) which is a playful, expressive number, so you are reminded not to take life too seriously. Your evolution depends on your joy, so follow this first. It’s not to say you should bypass the difficult work and sacrifice that the number 7 can sometimes bring, but ensure you see the light where it falls. Remember to smile, and laugh once in a while! The 7 can also be a strong indicator that you need to release something. If 777 are showing up for you at the moment, it may be that you’re basing your decisions and plans too much on other people’s opinions, experiences and stories. Is it time to release your reliance on the attitudes, viewpoints and research of others, and create some of your own? Where are you acting and speaking OUT of alignment with these, and why? Keep asking questions. The 7s are sending you on a quest, so keep with it, and follow closely with where you are being taken. There could be something in your life – a habit, a relationship, a belief, for example – that’s preventing you from digging that little bit deeper into your understanding of yourself, and peeling back that next layer, to reveal the more authentic version of you sitting just below the surface. Is 777 showing up to help you see what that obstacle is, so you can let it go? WHAT IS THE MEANING OF 7777? Seeing 7777 is a very powerful omen. It is a deeply mystical number, representing both beginnings and endings. This number represents the divine support you have on your path right now – your level of learning is of benefit to us all, so believe in your own power and influence! 7777 reduces to 1 (7+ 7 + 7 + 7 = 28, and 2 + 8 = 10, and 1 + 0 = 1) so YOU are at the centre! It is a sign that you much trust yourself and your journey as you have nothing to doubt and nothing to fear. Because of the spiritual and esoteric nature of the number 7777, your path may be taking you into the realms of mysterious, hidden or even taboo subjects. But the very appearance of this number means that you are ready to uncover the knowledge that lies there. 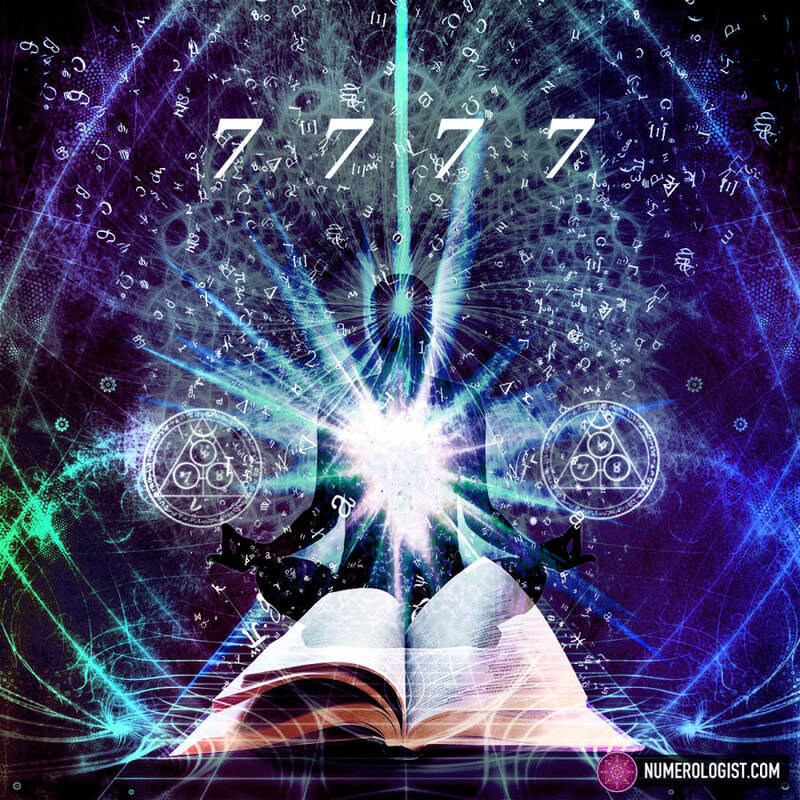 Seeing angel number 7777 is a sign that you are being divinely guided and supported right now, and the wisdom you require at this point in your life is there, waiting just below the surface! All you need to do is enter into the mystery and the answers you need will be revealed. Are the 7s showing up in your life at the moment? Are you moving to a place of greater understanding? Share your stories with the Numerologist community below, and let’s grow together.